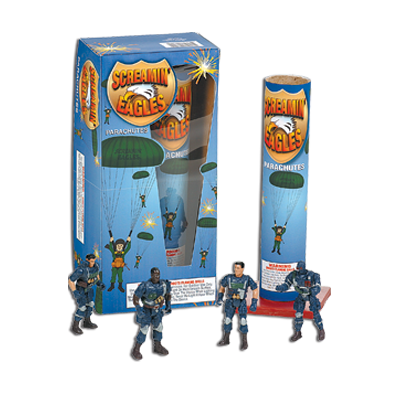 Screaming Eagles – A jumbo red, white and blue parachute that drifts to the ground as it crackles or smokes with a moveable army man attached. The kids will love this hot item! Paratrooper in Action Box - 4 Pack. Plastic toy soldiers hang on 10" parachutes, with crackling stars to draw your attention.